Hope springs eternal, but this spring is (currently) dry. Professional bad news abounded; delayed publications, rejection letters, and in some cases radio silence. While I have an enduring love of my part time job, I was drifting aimlessly across a professional wasteland and becoming increasingly pessimistic and depressed about my possibilities. When I’m unhappy, I wander around the internet, clicking on travelogues and Rick Steves’ websites. Thanks to a recent trip to Seattle, I had also been bumming around on the Olympic National Park website. 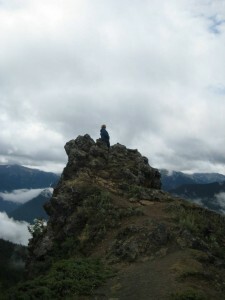 Hanging out on a precipice in Olympic National Park. Researching camping sites and hikes in Olympic, I stumbled into a wonderful gear shakedown website, which in turn led me to an unofficial AT website. A date caught my eye – a sentence which stuck in my brain.